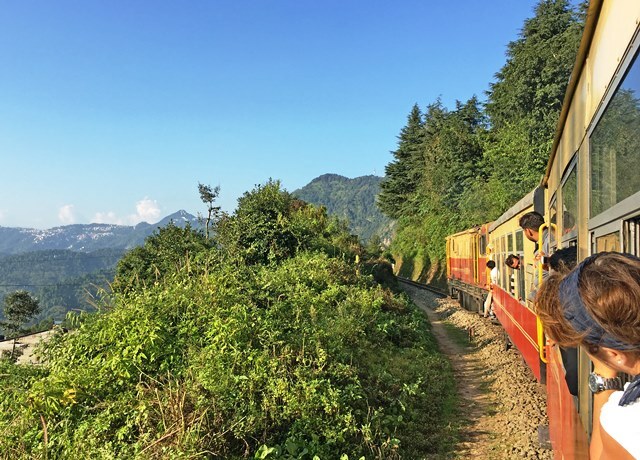 As we clattered along the narrow track, the mountains gradually emerged like shy ballerinas peeking out from behind a curtain of lush green foliage. Glimpsed intermittently at first, the foothills of the mightiest mountain range on earth rose amidst tiny hamlets and towering pine trees. A yellow butterfly flittered past the open window and the scent of lush plants wafted around our carriage. 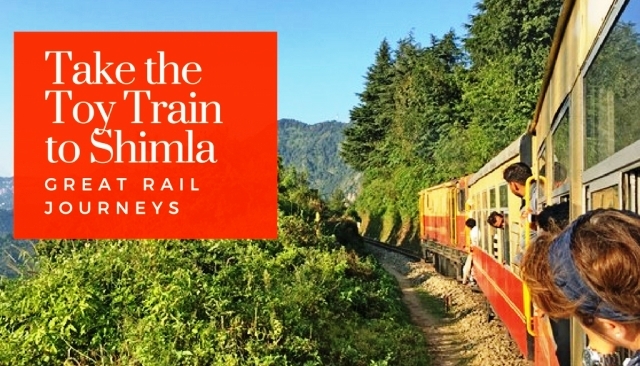 I was on the quaintly-named Toy Train Kalka to Shimla railway, enjoying a whistle-stop tour of some of India’s highlights with Great Rail Journeys. 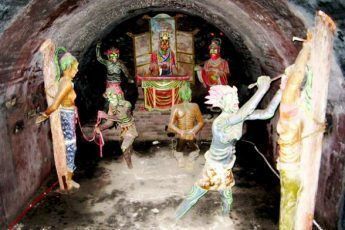 We boarded the train at Kalka, a small station in northern India named after the goddess Kali. Our luggage had been whisked away and we’d be seeing it next at the Oberoi Cecil, a luxurious hotel in Shimla. 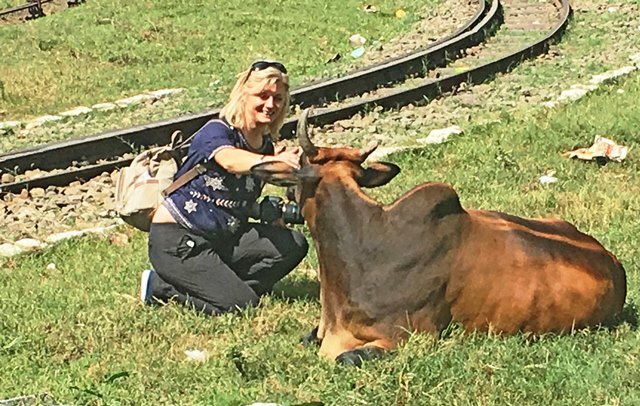 Having everything taken care of, from tickets to luggage and transport are just some of the great reasons to choose an escorted tour of India. Lunch boxes were handed out and we boarded the train in great anticipation. 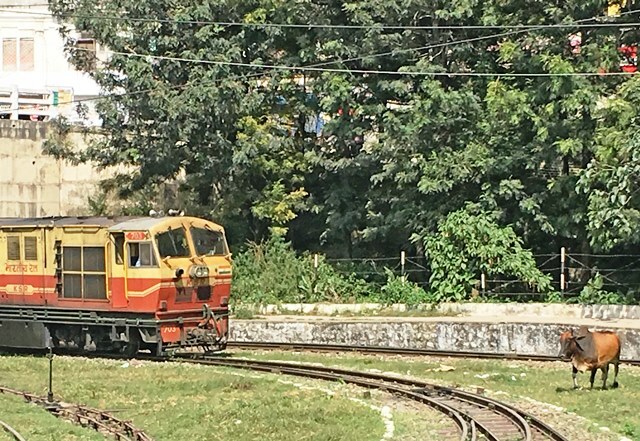 For many of us, the Toy Train journey was the highlight of this trip, along with seeing the Taj Mahal. 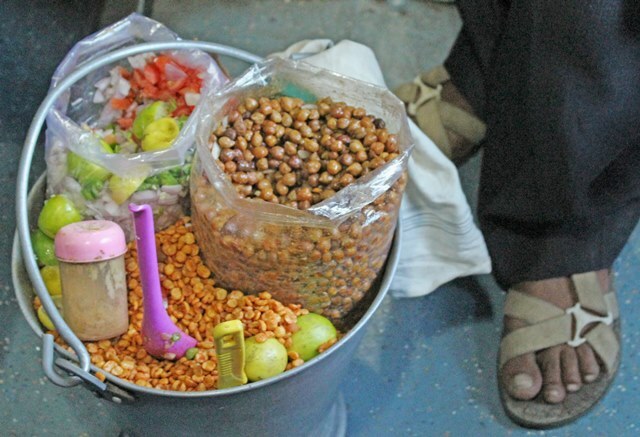 The carriage was fairly basic, with seats that benefited from the cushions we’d brought with us, air-con provided by open windows and meals served by a boy making up delicious chana chaat as we rolled up the sub-tropical Shivalik Hills. 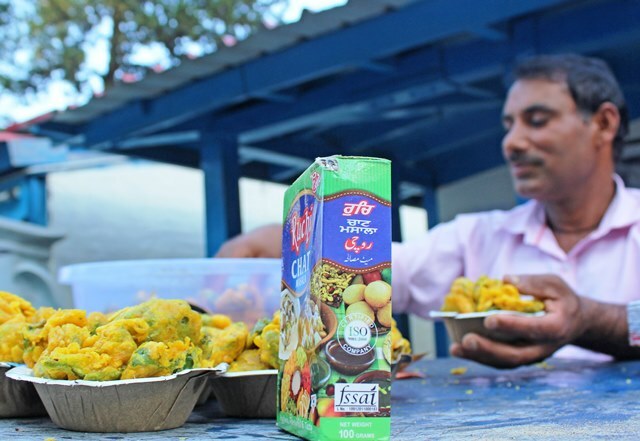 Chaat (Hindi: चाट – chat) is a savoury snack, typically served at road-side tracks from stalls or food carts in India. 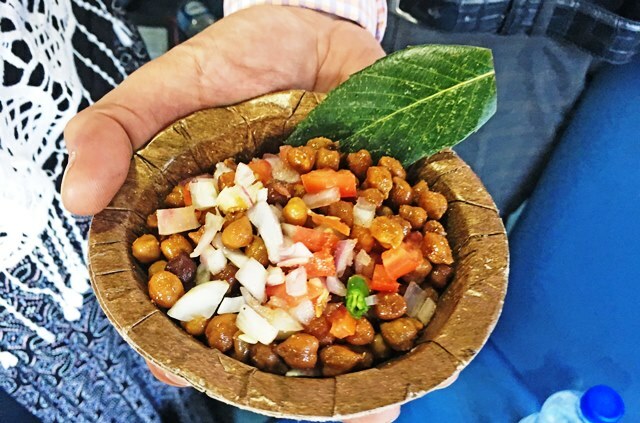 Ingredients include chana (chickpeas), potatoes, tomatoes, onion, chilli powder, roasted cumin seed powder, black salt and a squeeze of lemon. 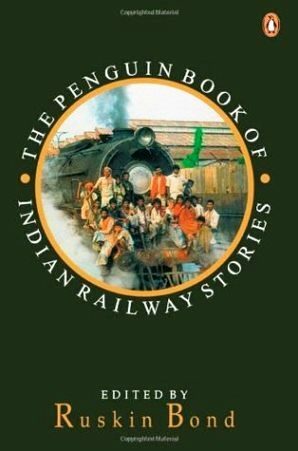 We were privileged to share the train ride with local historian Raaja Bhasin, who told us the story of the Toy Train and was a key player in getting it nominated for Mountain Railways of India UNESCO World Heritage status, which it achieved in 2008. 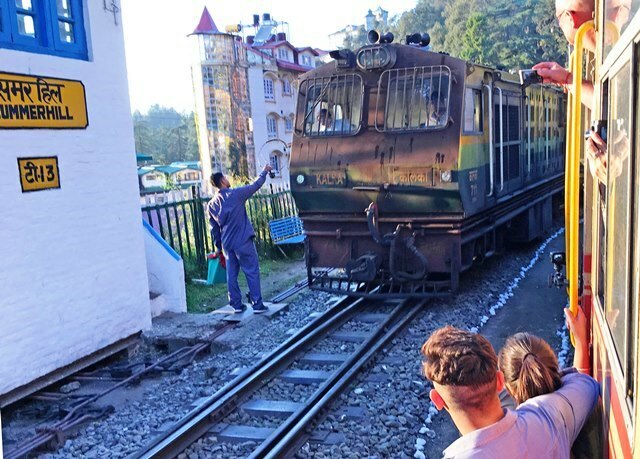 This narrow-gauge railway was built in 1898 to connect Shimla, the summer capital of India during the British Raj, with the rest of the Indian rail system. During its construction, 107 tunnels were built (103 remain in use) and over 860 bridges were built along the route, in one of the world’s most impressive engineering projects. (Disclaimer: the exact number of tunnels and bridges seems to vary a bit so don’t take my word for it!) The route is in the Guinness Book of World Records for the steepest rise in altitude in the space of 96 kilometers. More than 2/3 of the track is curved, sometimes at angles as sharp as 48 degrees. 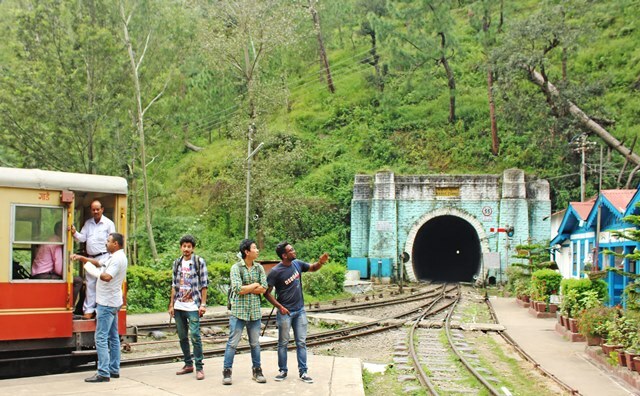 The Barog Tunnel, 1143.61m, is the longest tunnel on the Kalka-Shimla route; it took us more than 2 minutes to pass through it at about 15 mph. En route, Raaja also shared stories of his childhood train rides and how he developed a life-long passion not only for this impressive railway but also the stunning landscape that it encompasses. The journey takes about 5.5 hours; after a while, we got into a bit of a routine. Some gazed out of the window at the mountain scenery and villages, others made friends with fellow passengers, some read or checked their phones. For a while, I sat by the door, safely wedged in, to enjoy the fresh air and get closer to the beautiful scenery we were passing. 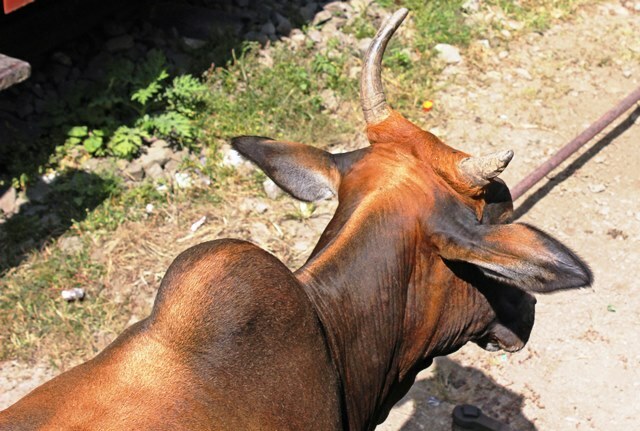 As we slowly rolled into Dharampur Himachal station we saw a cow sitting quite happily between the tracks. It looked up as we went past but wasn’t at all fazed by the noisy diesel train. 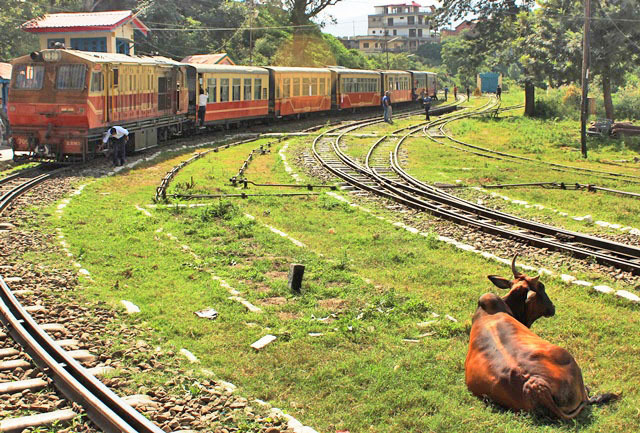 When the train had stopped, some of us jumped off to say hello to the cow and take a photo. We got really close, much to the amusement of the train driver and locals. Another train tooted its arrival and the cow got up very slowly and set off walking along the railway line in front of the engine. I was back on the train, leaning out of the carriage window to watch and the cow walked right past me, before the turning round and going back to its original resting place. It was the strangest herding I’ve ever seen. As we got higher up into the Himalayas the air changed; cooler, fresher and scented with something tantalisingly different from any other mountain region I’ve been in. 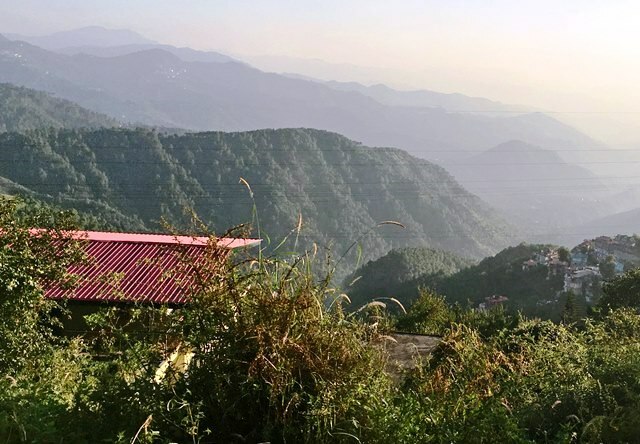 Himachal Pradesh is known as the fruit bowl of India. The fertile slopes are covered in orchards, meadows and pastures growing apples, pears, almonds, peaches, plums, grapes, mangoes, walnuts … Other crops include wheat, barley, maize and potatoes. Wild flowers dot the landscape and roses, tulips, gladioli and many other cultivated species are grown for local and international market. We were lucky with the weather as the sun shone brightly for most of our journey. 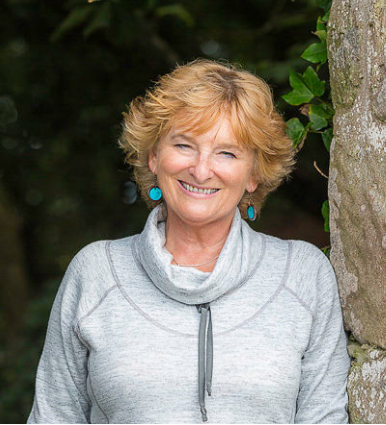 Eventually the light started to fade and the hills seemed clothed in a lilac-blue mist. There was some excitement as we got our first glimpse of Shimla (Simla) through the huge trees growing beside the railway track. I had an image of this historic hill town from numerous books and films as a small town perched on a hillside, caught in a moment in time, probably mid-1800s when it was the centre of British Government for the British who ruled a large part of India at this time. The urban sprawl of high-rise office blocks and thousands of apartments and houses built on two sides of a mountain was a bit of a shock. 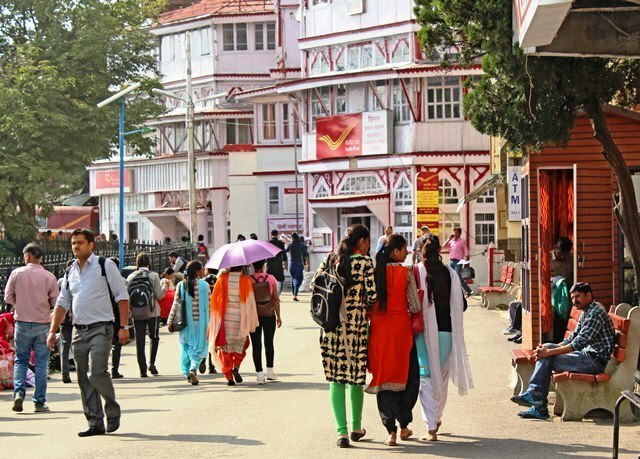 However, the colonial heart of the city is beautifully preserved and old Shimla retains many of its past attractions. 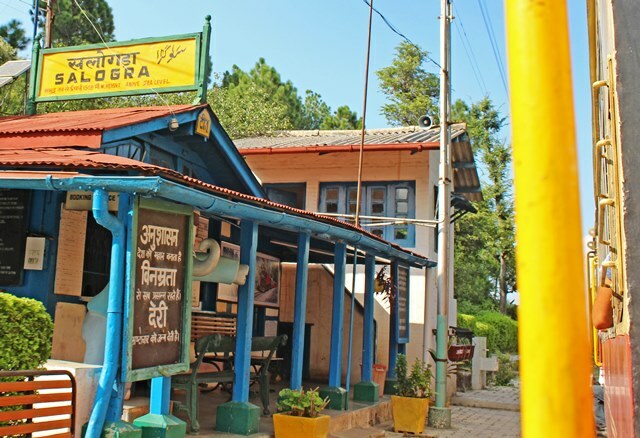 We stopped briefly at Tara Devi and Summertown stations before making our way slowly to our destination. 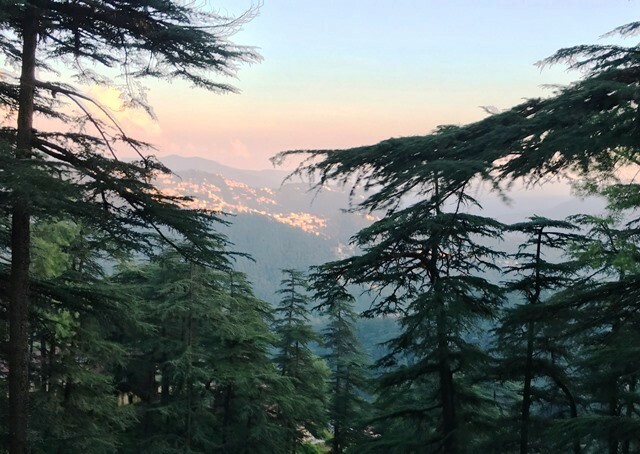 As the sun set the hills alight with a rosy pink glow, we alighted from the sturdy Toy Train to begin our exploration of historic Shimla. 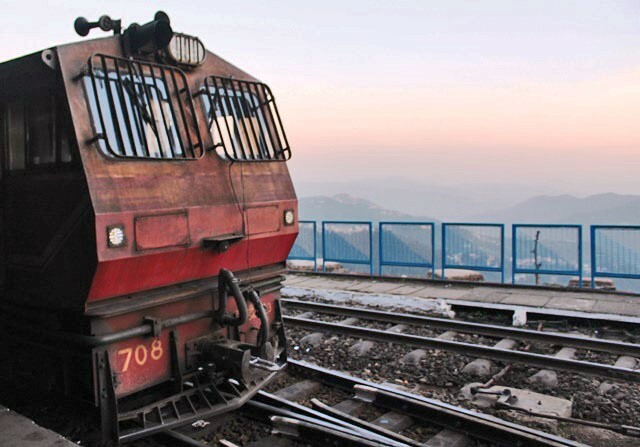 Our train ride had taken us from the hot lowlands of northern India to the cooler climes of the Himlayas on an unique and unforgettable trip through some of the most spectacular scenery to be seen from any railway line in the world. 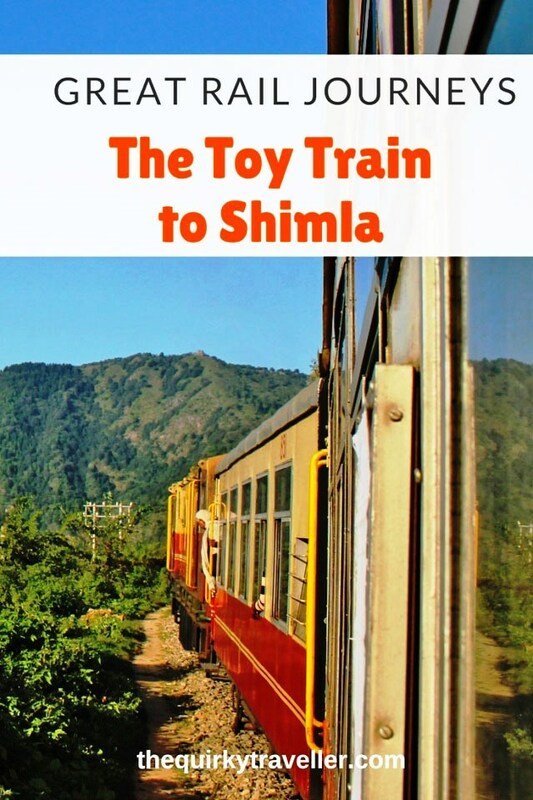 I’ve been on some wonderful railway journeys including the Glacier Express and Jungfaruhoch in Switzerland, the Flam Railway in Norway and the Snowdon Mountain Railway but for sheer majesty, colour and leisurely pace the Toy Train tops the bill. Spectacular railway. 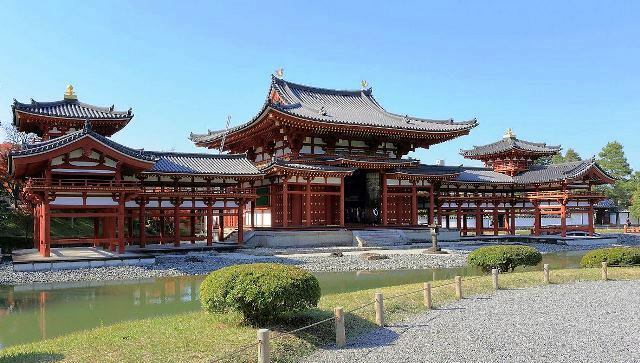 Be interested to read more about its history. Looks like you had a fun time. We certainly did. 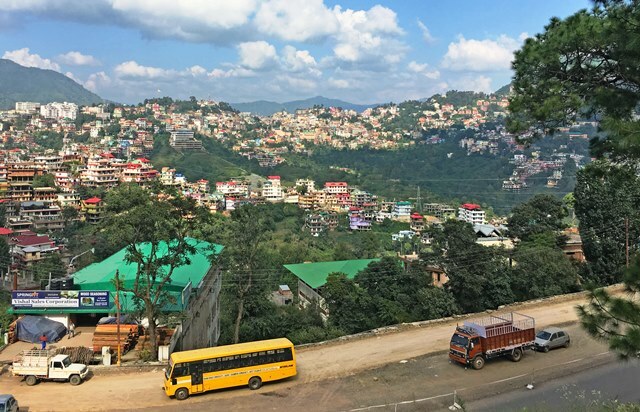 It was a truly unforgettable trip, not just this part but being able to visit Shimla and see other great sights of India including the Taj Mahal. Click on the link to the Toy Train in the first paragraph for some Wikipedia info.